Mission: To provide well-documented tools to build finite element codes for a broad variety of PDEs, from laptops to supercomputers. Vision: To create an open, inclusive, participatory community providing users and developers with a state-of-the-art, comprehensive software library that constitutes the go-to solution for all finite element problems. deal.II is open source and available for free! There are many resources for learning deal.II and asking for help. deal.II is a community project. We welcome all who want to participate! deal.II, like many other computational math software projects, is developed by a community that is not very diverse. In parts to address this, we will run a summer school targeted primarily at young scientists from underrepresented groups in our community. See here for more information. The 7th deal.II Users and Developers Workshop will be held in Fort Collins, CO, USA, August 6-9, 2019. For more information, see here. 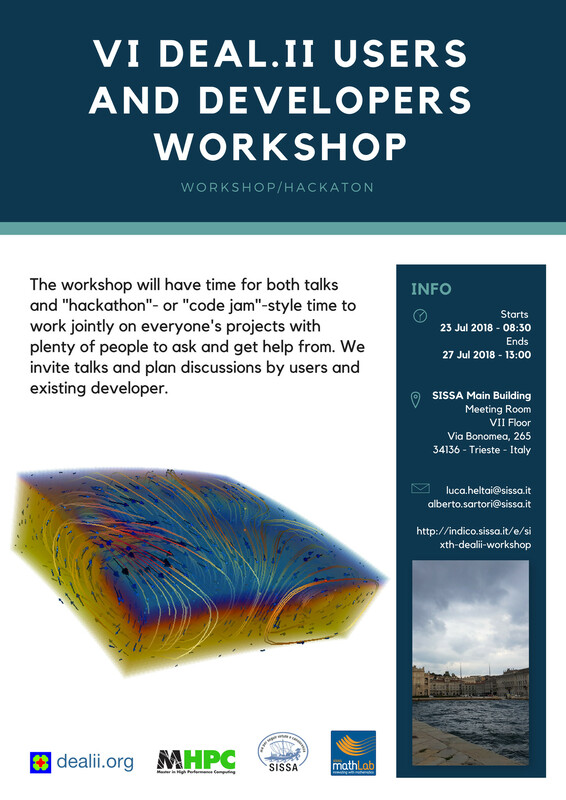 The 6th deal.II users and developers workshop happens in Trieste, Italy, July 23-27, 2018. For more information, see here and here. deal.II version 9.0.0 was released today. A full list of changes can be found here and a long description of changes is in the manuscript here. Download links are on the download page, or the release page on github. The deal.II discussion group is used by developers to announce new features and by users to ask questions about how to do things with deal.II. This is also the forum to post bug reports. The development of the library is done on the github.com deal.II project using Issues and Pull-Requests. You can send an email to the project administrators Wolfgang Bangerth, Guido Kanschat, Timo Heister, and Matthias Maier if necessary. We appreciate comments and suggestions on deal.II. They can be addressed to either of the addresses above, depending on their public or private nature. Legal Notice: Some countries' laws require us to post this legal notice.